I stayed here solo for 4 weeks. 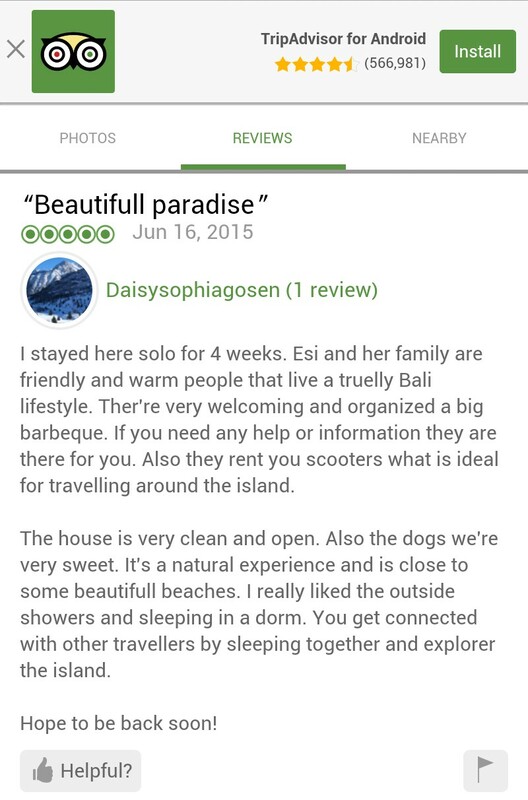 Esi and her family are friendly and warm people that live a truelly Bali lifestyle. Ther’re very welcoming and organized a big barbeque. If you need any help or information they are there for you. Also they rent you scooters what is ideal for travelling around the island. The house is very clean and open. Also the dogs we’re very sweet. It’s a natural experience and is close to some beautifull beaches. I really liked the outside showers and sleeping in a dorm. You get connected with other travellers by sleeping together and explorer the island. I live by the beach, counted as one of my achievement of millions dreams I have. Fall in love with Bali, my so-called 'my happy place'. Padi Licensed Diver, try (but keep failing) on Yoga, running on the beach during sunset, and now learning for not getting juiced by the wave on my yellow boogie board. To Life is human, to TRAVEL is Live. Visited 4 continents, 13 countries, and 28 cities outside Indonesia so far. And found out that Indonesia has the purest beauty, so I am now nestling down on the Island made when God was smiling. Gallery | This entry was posted in Uncategorized and tagged #ehomestay, Beautiful paradise, budget accommodation, Canggu, clean, dorm bali, hostel, Surfing, trip advisor. Bookmark the permalink. "Some facilities are also part of our Community & Social Responsibility to support young local surfers"
Body boarder-surfers family, mixture of Bali tradition & modern Jakarta. We have permanent job, but we will try to say hi. Mingle with our locals and foreigner friends often hang out at our place or by the beach. As one of guest said, it is like a home away from home.